A Dog Bite (or any type of domestic animal bite) can be a very serious issue. Believe it or not, the law in Michigan used to be that every dog was entitled to one free bite. That’s right, one of the defenses to a dog bite case is that the dog simply had never bitten anyone before. Knowledge of the dog’s violent propensities, in the law called scienter, was a requisite to establishing a dog bite case. NO MORE, Michigan passed its dog bite statute in 1939, establishing that dogs no longer had a free bite coming to them. The Michigan Statute establishes that the owner of a dog is liable for damages to anyone the dog bites. So what defense does a dog owner have to these claims? Only one. Provocation. 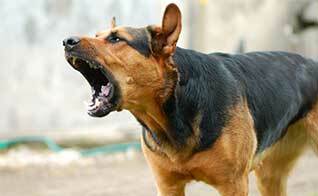 If the dog is provoked by the victim prior to being bit, it establishes a statutory defense to the action. Of course, it is typically up to a jury to decide such provocation existed. Examples of provocation could be anything from simply rough-housing with the dog to more insidious things like taking away the dog’s toy, removing it’s food while it was eating, grabbing the dog around the head or neck. Any action by the victim placing the dog on alert could be found to be provocation by a jury, and if provocation is found, the dog owner would not be found liable for the attack. It is important for a victim of a dog bite to speak to an attorney before giving any statement to an insurance company or, if possible, the police. Always remember the words you use in these statements and police reports will come back to haunt you. So, if you do give a statement, be precise with the facts and relay it exactly as it happened. Other things to remember in dog bite cases are trying to identify the dog, the dog’s owner, and by all means call the police right away after suffering from a dog attack. Remember, a dog attack can leave scratches, tears, broken bones. There have even been cases where victims have lost limbs. If you are attacked by a dog, call the police and get immediate medical help. Cleansing of the wound is vital in avoiding infection, which could lead to even greater problems than the initial wound left by the dog. Of course, Michigan law also allows for the collection of damages for the aftermath of a dog attack, including infection. Always be on your guard with strange dogs and remember, let sleeping dogs lie. If you are attacked by a dog, please contact our office to get free advice as to how to proceed. And remember, there is never any charge for attorney fees until the Southfield dog bite attorneys at Wigod & Falzon win your case.